Although Dora had some mistakes with ball and ribbon, she had a good competition. I have not had the pleasure of watching Dora live but I have heard that she looks even more beautiful in person. For many years now, Dora has been Hungary’s only world class rhythmic competitor. I am not sure if she has plans to retire but it would be great if someone equally dedicated followed in her footsteps. The most elegant “surprise” of this event. A gorgeous clubs routine, which I enjoyed a lot and thought deserved more. Ana Luiza is fairly young but she already stands out with a very beautiful figure and just a natural grace. Maria had a tough competition, with many mistakes. Even with hoop, her crown routine, she did not seem confident enough. But she has gotten many scores over 17.5 in the past, and she can receive them again if she is clean, especially with hoop, and possibly with ball, too. I find it hard to excuse her ribbon and clubs mistakes, because I don’t consider these two routines to showcase the maximum difficulty she can perform. Unlike most Ukrainians we are used to seeing, Eleonora does not look powerfully expressive and confident on the carpet, and expression is certainly something she needs to work on, but she does beautiful work as far some of her jumps and pirouettes, and if she does not make mistakes, she will fall into the scores of over 17 easily. Her ball is my favorite routine, but she made the most mistakes with it at this event. What a great way to dazzle the home audience! Beautiful, lively routines, great risks, very clean fouettes, and even though she had errors with ribbon, I actually loved this routine the most. If she keeps working this hard, she will do much better than 15th spot. She has everything she needs to be more than the second best Azeri gymnast. For every beautiful, expressive and just uniquely charming routine Varvara does, she does one where she drops everything. So, at this event, she did a brilliant ribbon and ball, and made mistakes with clubs and hoop. I wished she made the ribbon final, though, because she deserves it. She really exudes beauty, vibrant energy, and joy. I like Carolina’s ball routine a lot, but I feel like she is showing us elements we have seen many times in past seasons and that she currently just relies on her reputation as a “veteran” gymnast to get the scores that she does. Ordinarily, I would put Filiou and Romanova before her, even Ayshan. But they all made many mistakes. If Carolina wants to stay in the top 15, she will need to make some changes. I am very sad that Neviana made some errors with hoop, because she deserved to be ahead both Filanovsky and Ruprecht. Her ribbon and ball routines at this event were the best I have ever seen them. She made the clubs final, but, really, she should have received a higher score with ribbon, where she shows some very sophisticated apparatus work. Neviana should constantly aim for scores over 17.5 and she should get used to them. Her goal should be to make not one, but 2 or 3 finals at events. I think Nicole did some nice work with ball and clubs especially, but the apparatus difficulty she has does not measure up to elite yet, and neither do her jumps. The judges must really like her to count all of her difficulties, because, although she does not make big mistakes, she is far from clean. Solid competition from Victoria, but I feel like I am watching the same routine with every apparatus. She is very talented but I would love to see some variety in the apparatus work and some more expression. She and her coach were very pleased with her scores. So, Neta had a disaster with clubs, which made her coaches very nervous, as the picture below shows but she made up for it on all other routines and made 3 finals, which is wonderful and well-deserved. I think her ribbon performance has improved a lot. I expected a lot more form Marina. In particular, I expected her to place before Moustafaeva and possibly before Halkina as well. This season Marina has come out with very strong, different routines, particularly with clubs and ribbon. She is one of the best ribbon performers in the world right now. I attribute her huge error with clubs to being nervous in front of the loud home crowd. By far one of her strongest competition. She was very clean and really just seemed to fly across the carpet. Also, she showed improved interpretation of the music in her routines. The ball routine was my favorite. Ironically, Kseniya did not make the finals but is a reserve for several of them. The rules at the European Games really work against Katya, who did a very good competition but did not make any finals because only one gymnast per country goes to the finals. Katya consistently places in the world’s top 6, and I think this season she has been more exciting to watch than Staniouta. Too bad for the error in ribbon. For me, she was the most exciting star of the event! Made all 4 finals. Beat both Durunda and Halkina, not to mention the girls from Israel. Absolutely energized and captivated the crowd. I don’t know which of the 4 routines was better. They were just sublime. But this time I vote for ball. As the commentators pointed out, the dynamism, speed and level of energy, as well her coverage of the carpet are just dazzling. Her choreographies really emphasize the most beautiful and strong aspects of her personality. Ganna is in all 4 finals, too, but she must be disappointed with her 4th place. Ganna currently has the fastest and cleanest pivots in the world and I love watching her spin on the carpet, but I don’t love her apparatus handling at all, and I think her ball routine leaves a lot to desire compared to previous seasons. I like her work with hoop the best, but I am not thrilled about the clubs at all. And I think she needs more work to make her Carmen with ribbon really memorable. Very confident, mostly clean routines, though I am bit disappointed by her work with ribbon lately. Also, the ball routine is a bit old and I feel like I have watched it way too many times. It would be great if she added some new apparatus skills. Solid work and not surprising placement in all 4 finals, though. 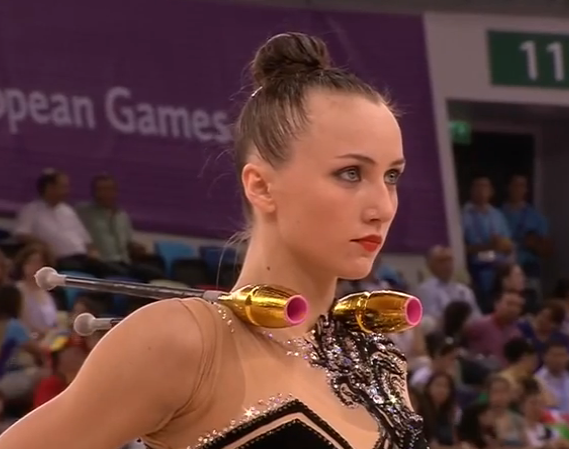 Halkina is a lot more original now. The ball needs to go despite this wonderful leotard. While I appreciate Rita’s unique style and expression, I think lately she has started to seem very cautious and almost nervous about making mistakes. Her clubs routine performance has improved, but she only made one final (hoop) because Kudryavtseva keeps outscoring her. She would need to step up if she wants to really threaten Yana’s position. So, overall, Staniouta, Pazhava and Rizatdinova made all 4 finals. Durunda and Rivkin each made 3 finals, and, surpassingly, though for different reasons, Mamun, Ruprecht and Vladinova made 1 final each. As expected, the 7th Asian Championship was dominated by the Korean star Son, who is probably aiming to place among the top 8 in every apparatus at the world championship. Although she made some mistakes at this championship, she won the all around without much argument. Nazarenkova from Uzbekistan got second place, also well ahead of the top Japanese gymnast Sakura Hayakawa. Uzbekistan won the team gold. Although Son, Nazerenkova and Hayakawa all have been receiving high scores all season at various Grand Prix and World Cup events, I think their routines at this stage lack a "wow" factor. The really interesting music, or that original element that will be remembered for a long time just isn't there. Ashirbayeva is very young and I expect her to make a lot of progress if she stays injury-free and continues to improve. What is disappointing is that China has not presented a new and exciting gymnast yet, not since Deng retired.